Volkswagen has unveiled the first pictures of the Golf GTE, a new plug-in hybrid version of the Golf hatchback that combines the eco-appeal of a hybrid with the drive of a Golf GTI. The Golf GTE is due to be revealed at the Geneva Motor Show in March. 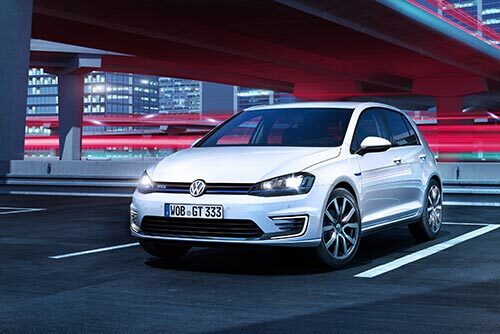 The name of the Golf GTE reflects its ‘Electric’ power alongside the petrol-powered GTI and the diesel GTD in Volkswagen’s Golf GT line-up. The Golf GTE is driven by a 1.4-litre 148 bhp direct-injection petrol engine and a 100bhp electric motor. Together, they combine to produce power of 201 bhp and range of around 580 miles. On electric power alone, the GTE has a top speed of 81 mph and a range of 31 miles. Using petrol and electric, the GTE can sprint from 0-62 mph in 7.6 seconds and on to 135 mph. Alongside this performance, Volkswagen claim impressive economy figures for the car, boasting 188 mpg on the combined cycle and CO2 emissions of 35 g/km (provisional figures). Drive is through a familiar six-speed DSG gearbox, with a triple-clutch system that has been specially developed for hybrid vehicles. The GTE’s 8.8 kWh lithium-ion battery can be charged in around three and a half hours from a domestic mains outlet, or two and a half hours from a domestic wallbox. The battery weighs 120 kg, giving the car a kerbweight of 1,520kg (compared to 1402 for the petrol GTI). 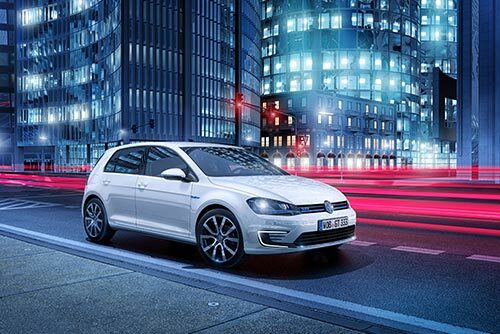 Visually, the Golf GTE offers up more ‘eco-sporty’, combining elements of both the e-Golf and the GTI. 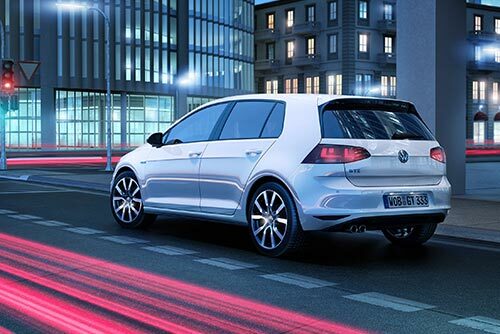 The front bumper features C-shaped LED daytime running lights, similar to the ones found on the e-Golf and aerodynamic horizontal ‘fins’, similar to the GTI. While the GTI has a red stripe, the GTE has a blue one. This runs across the grille and into the headlights which, like all of the lights, are LED. In the UK, 18-inch alloy wheels will be standard and the car will only be available as a 5 door. Inside the blue highlight continues, in the stitching on the steering wheel, gear lever gaiter and in the tartan pattern on the sports seats. The dashboard will be familiar to GTI drivers, with the addition of a power meter in the central display, which shows how much power remains in the battery and whether it is being re-charged. The car comes with DAB radio and Bluetooth as standard, while the GTE’s 8-inch satellite navigation system also includes EV functions, like the ability to identify potential destinations within electric range and electric charging points. Volkswagen have not revealed pricing for the car as yet but UK order books will open late August, with deliveries expected before the end of the year.